Leading Manufacturer of lime stone and chocolate limestone from Pune. 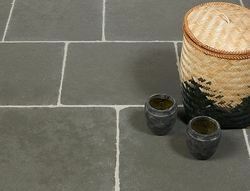 We are offering an extremely graceful and stylish range of BLUE / BLACK / GREEN limestone that provides alluring effect to any place. It has a characteristic light brown color, and is available in modish designs and incomparable patterns. To furnish the diverse requirements of our clients in the best possible manner we are involved in offering an extensive range of Chocolate Limestone.